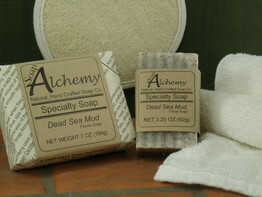 Soap Alchemy uses important Dead Sea Mud in a number of products. Dead Sea Mud has a high variety of minerals and mud from the Dead Sea. Many people take trips to soak, bath and take mud baths in the Dead Sea. The salt concentration in the Dead Sea will make a person float. Dead Sea Mud helps soften skin. Dead Sea Mud, imported from the dead sea, gives you all the wonderful minerals from the dead sea in a dead sea mud mask. Not to be used every day, many people report how it softens their skin.